NOTE: It’s been an adventure here at the Daybook Labs. I don’t want to go into details, but after fifteen or sixteen weeks of staying ahead, inevitable weirdnesses struck all week. For two weeks! Have faith, True Believers! When a letter arrives from the foundling home, Collinwood is driven into a frenzy of suspicion. David thinks it’s more evidence that he’ll be sent away, grounded in his paranoia that he is connected to his father’s attempted murder. In fact, it’s a report that a detective under Devlin’s employ checked into the circumstances under which Vicki was hired. Liz bullies Roger into corroborating her story that he, himself, hired her based on the recommendation of a mutual acquaintance. Roger parrots this to Vicki, who’ll have none of it. Later, when snooping through David’s things, Vicki finds the bleeder valve for a master brake cylinder. Joan Bennett does lots of Looking Worried on the show, but here, she’s somewhere between a bully and a valkyrie. Who else could stymie Roger in his tracks? And Vicki shows backbone, too. The early part of DARK SHADOWS works where Victoria Winters becomes one of daytime television’s sharpest detectives. The cliche is that she doesn’t understand. The reality is that she understands far more than we credit her for. Nicholas stops Angelique from killing Adam, thus shoring up his friendship with the promethean. Angelique nevertheless tries to kill Adam again, voodoo-style. Nicholas, his work seemingly never done, points out that her love for Barnabas makes her more his servant than Diabolos’, so he strips her powers. Roger enters and tries to force her upstairs. Evading him, she goes to the Old House to deal with Barnabas, human-on-human. When Barnabas again refuses to admit his love, she pulls a pistol on him to end his life in a way she’s certain will work. Beginning with Louis Edmond’s first crack at narration, we once again see the show breaking new ground. Of course Nicholas stops Angelique, and of course he correctly points out that her master is Barnabas. What fascinates me most is what she does with her humanity. Lara Parker’s confrontation with Frid shows the range of her acting at it’s richest and most varied. And the crisp, deeply felt writing supports her every step of the way. The cliche in any scene is that we should never see where the characters are going. Well, duh. But in her final confrontation with Barnabas, we don’t. No matter how many times I see the episode, and see the integrity of her love, I never expect her to kill him as a man with the weapon of a woman. How sad. How saw. How real. 1897. Hoo-boy. Jamison, possessed by Petofi, makes hay across Collinwood. After stunning Edward with his worldly insouciance, he goes upstairs to leer at and play cards with Beth, immediately putting the whammy on her and having her proclaim her allegiance to Barnabas, breaking Quentin’s heart. Meanwhile, Quentin is in deep mourning over the death of his own son, confronting Edward about the truths he was never allowed to learn. 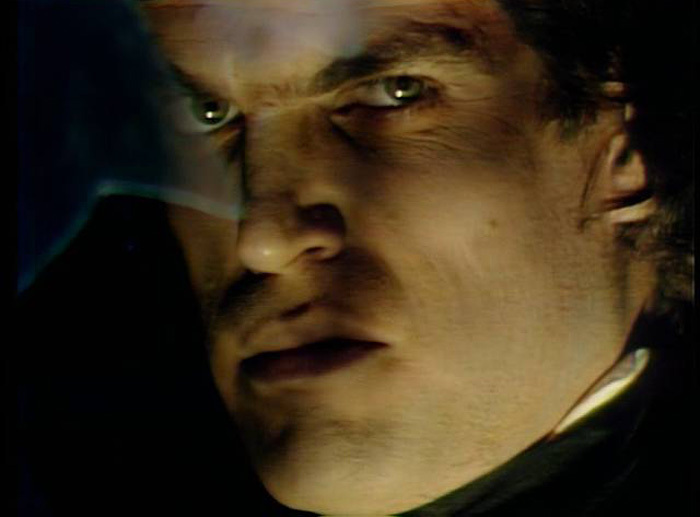 Quentin moves on to confront Barnabas, who sadly explains that Beth was simply a means to an end. 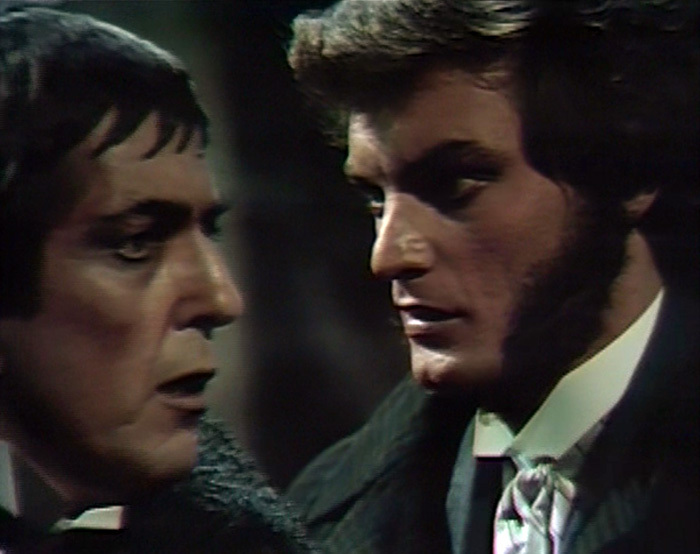 Edward, once eager to kill Barnabas, is hypnotized by Petofi into thinking himself a simple manservant. That, and Jamison gets his Petofiesque prosthetic hand ripped off. Anyone who doubts that DARK SHADOWS contains acting as fine as any on television can watch this episode, and if they still disagree, consign themselves to a UPSTAIRS, DOWNSTAIRS marathon for all eternity. These are seasoned, stage actors, and I will assure you, that is not an easy thing to become. When Edmonds and David Selby go at it, it is with high stakes, virulent theatricality, and utter authenticity. This is backed up by writing that, for this author, matches the depth and eloquence of Arthur Miller at his finest. Just as 1897 departed from the norm in terms of its imagination, so then did it depart from the pedestrian humdrummery that lived in the language and content of the Soap Opera. This is not a soap opera. This is theatre at its very finest. 1995. Carolyn greets Barnabas and Julia at the tomb where both must play it cool to evade further suspicion. They end up on the wrong side of Collinsport’s new, good ol’ boy sheriff, who may be bamboozled by Barnabas’ story that he’s his own son, but nonetheless advises them to check on their property and vamoose. He’s clearly in Carolyn’s pocket, and she further alarms him when she shows the sheriff photos from 1970 of Julia looking exactly the same. Back at Collinwood, Barnabas and Julia find objects moved from the previous day, knives coated in blood, poltergeist activity, and phantom lullabye music. After a bust statue nearly kills Julia, both beat a hasty retreat as a Victorian ghost sneers at them from the wings. How did Collinsport get a good ol’ boy sheriff? And is Barnabas going to sneak Moxie in from Logansport in a truck with Julia driving a Trans-Am? All kidding aside, the horror -- genuine, apocalyptic horror -- mounts. Uncomfortable stuff, and just as brave.